theme will include a animated background of American Flag, Flag animated on when button is in focus, custom menus/popups, and icons in one downloadable package. 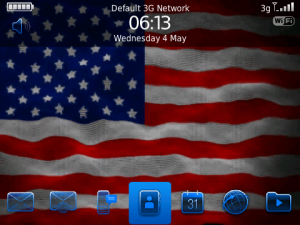 Theme display may vary based on your handset capabilities. Please leave a review on BlackBerry App World – with your review we can continue to serve up great new themes. Lets make BlackBerry fun! PLEASE TAKE A FEW MINUTES TO READ INSTRUCTIONS BELOW. Please check you have the required Operating System. Support for OS 5 + only application screen – select option – about. Due to possible connection errors with mobile providers we recommend using Wi-Fi when available. 1. Options spanner looking Icon from the Applications screen. 2. From the Options menu, scroll down to Theme and select it. 3. Highlight a different theme, and click it. 4. Return to the Options menu. 5. Exit out of it. Now youre using a different theme. For optimal performance please remove battery after b-2-studio Theme install. Please contact Support to file a technical Issue. Any information you provide will help us deliver a better service and more free themes. You will be contacted as soon as a new version update is available.